Luckily it wasn’t a real battle, nor did we have to fight on old ships, but the fierce Spanish fighting spirit definitely shows in the way they race their most important mountain bike stage race. I’ve pretty much done a race in every country in Europe, but I’ve never been to Spain, so I was excited to experience this new country and race, but even more so to integrate with my the new team. 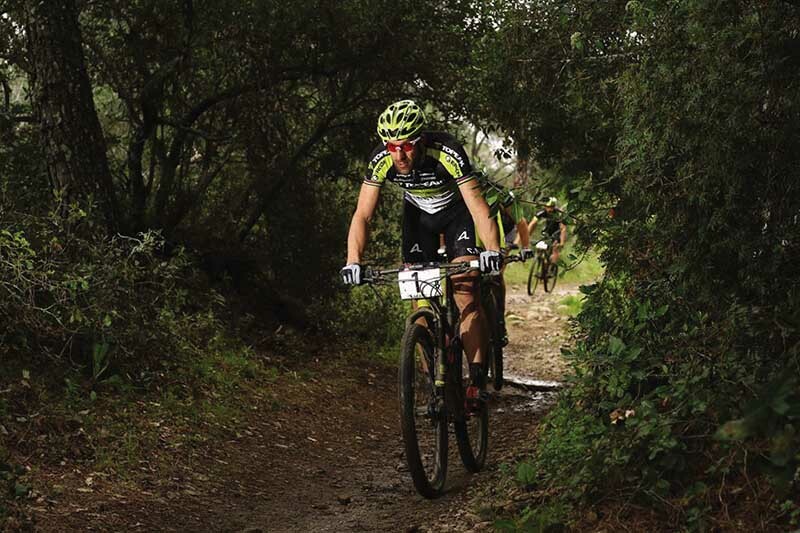 The Andalucía Bike Race is a six-day mountain bike stage race in the south of Spain. The Andalucía is famous for its olives. I could understand why, as literally the only thing you can see apart from the towns, are olive trees, millions of them! I loved the olives and olive oil. 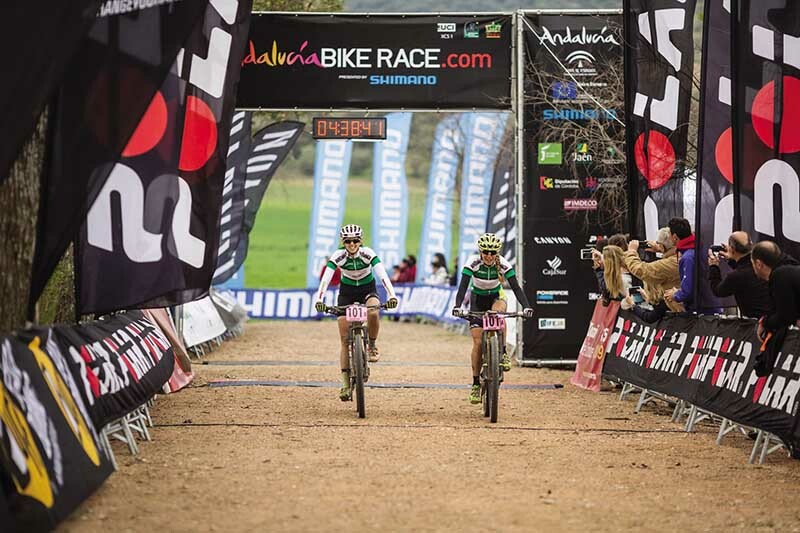 Sally Bigham and Katrin Leumann winning the Andalucia Bike Race for Topeak Ergon Racing. For Team Topeak Ergon, and especially me, the Andalucía Bike Race held more importance than just racing, it was the first time the team got together for 2016. It was a good opportunity for planning the year ahead, taking some photographs for the sponsors and to see how I integrated with the team. I knew all the riders, but it’s different living in close proximity. Fortunately we hit it off from the beginning. Personally I could not be happier. I’m very fortunate to be part of such a great group of people. Back to the riding. I was surprised by the technical terrain of the race. There were some really fantastic trails; some even so tricky we needed our full focus on not putting our feet down. It was awesome! I teamed up with American mountain bike legend, Jeremiah “JB” Bishop and he will do all the team races with me this season. We connected like two old school buddies and for me that is just as important as riding ability, if not more so. The racing was hard! Especially the starts, they were like full blown XCO race starts. Every Spanish rider was eager to show his face in front on their biggest home stage race, but that was great preparation for what lies ahead at the Cape Epic. Alban Lakata, and Kristian Hynek had a great start to the week; they won the first time trial stage and a few more stages along the way, but sadly lost the leaders jerseys on the last day. JB and I sadly suffered some technical issues on one stage, but other than that, rode a super consistent race, finishing eighth overall. A major highlight was standing on the podium on stage three with our team leaders who won the stage! Topeak Ergon’s World XCM Champ Alban Lakata in action. The Andalucía Bike race was a mission accomplished for this year. Sally Bigham and Katrin Leumann won the women’s event and while the men’s team might not have won overall, it was about finding the rhythm at the first race of the year, testing equipment and making sure all the staff and riders are ready to go! A long full season still lies ahead and it is great to be in such a professional and fun team!